Morning visit to Palo Alto’s Gamble Garden, to stave off catatonic despair at the news of the day. One bed cleared out to make space for a pollinator garden. Lots of plants at the ends of their seasons, winter plants not yet going. But tons of cheery autumn-blooming anemones. Monarch butterflies. 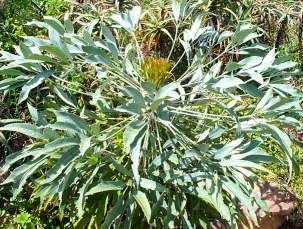 And four especially notable plants: hyacinth beans, ‘Soft Caress’ mahonia, a mountain cabbage tree, and a cucumber tree (a species of magnolia). Lablab purpureus is a species of bean in the family Fabaceae [the legumes]. 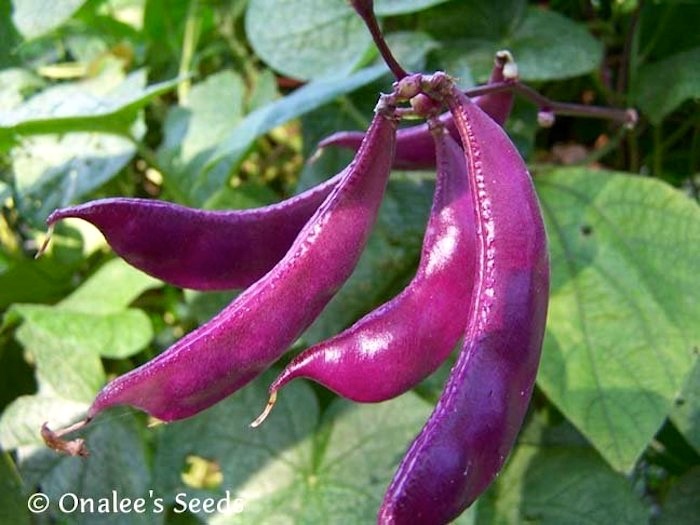 It is native to Africa and it is cultivated throughout the tropics for food. 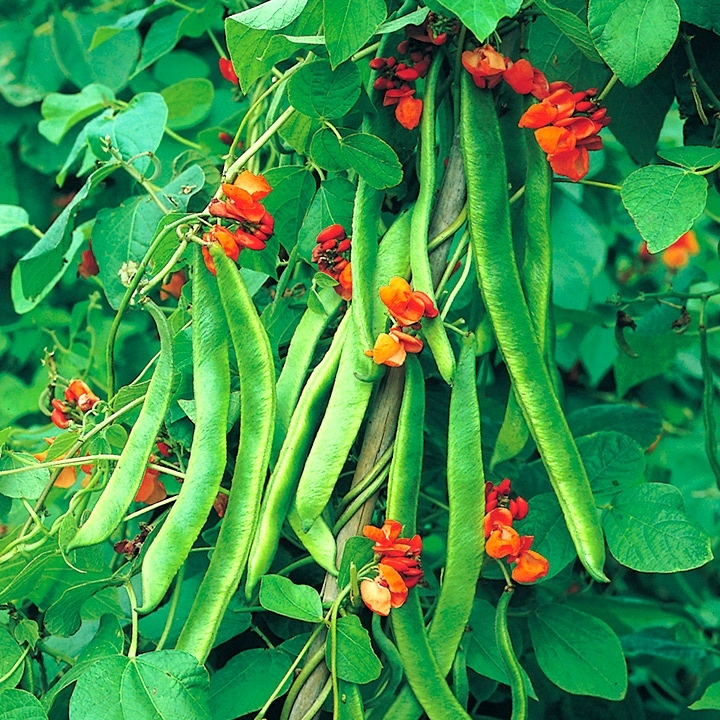 English language common names include hyacinth bean, lablab-bean, bonavist bean/pea, dolichos bean, seim bean, lablab bean, Egyptian kidney bean, Indian bean, bataw and Australian pea. It is the only species in the monotypic genus Lablab. 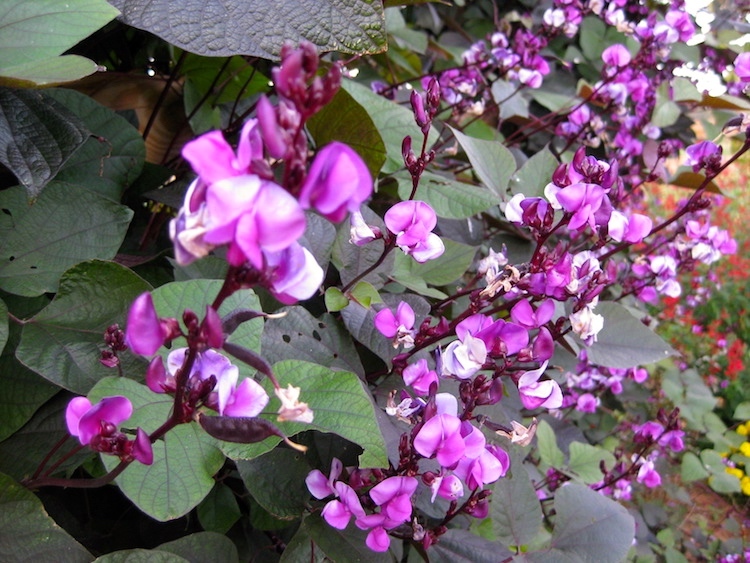 … The hyacinth bean is an old domesticated pulse and multi-purpose crop. Due to seed availability of one forage cultivar (cv. Rongai), it is often grown as forage for livestock and as an ornamental plant. In addition, it is cited both as a medicinal plant and a poisonous plant. The fruit and beans are edible if boiled well with several changes of the water. Otherwise, they are toxic due to the presence of cyanogenic glycosides, glycosides that are converted to hydrogen cyanide when consumed. Signs of poisoning include weakness, vomiting, dyspnea, twitching, stupor, and convulsions. It has been shown that there is a wide range of cyanogenic potential among the varieties. The leaves are eaten raw or cooked like spinach. The flowers can be eaten raw or steamed. The root can be boiled or baked for food. The seeds are used to make tofu and tempeh. At first glance, [Mahonia ‘Soft Caress’ is] not at all like the mahonia shrub my father grew in our garden when I was a teenager: this plant has bamboo-like foliage, but the mahonia in our Wyomissing Hills PA garden had leaves that looked like holly leaves, and my dad referred to it as an Oregon grape holly: grape for the blue berries on the plant during the winter, holly for the prickly Ilex-like leaves, and Oregon for its origin in the shady forests of the Pacific Northwest. 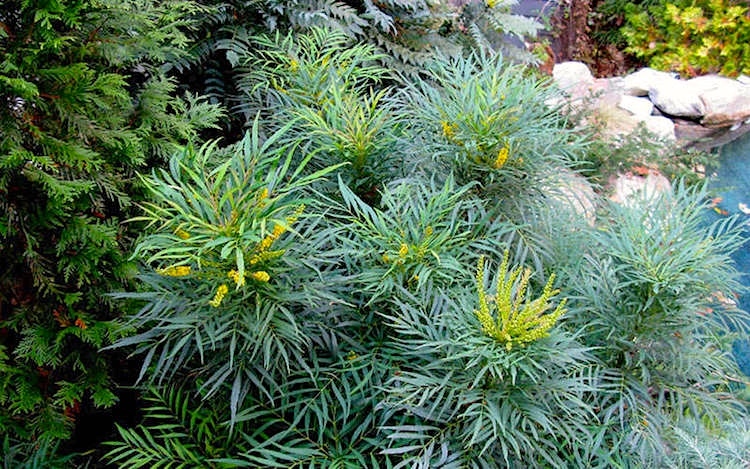 Now it turns out that the holly-leaved mahonia of my youth and the bamboo-leaved mahonia in Gamble Garden are shade-loving evergreen plants with similar yellow flowers and blue berries, and are in fact both in the genus Mahonia, very closely related to barberries (in the genus Berberis). Both Mahonia and Berberis are in the barberry family (Berberidaceae) — with nothing much taxonomically to do with either hollies (in their own plant family, Aquifoliaceae) or bamboos (in the grass family, Poaceae). This is a short, thick-set tree, rarely exceeding 5 m in height. It is sparsely branched with grey, longitudinal fissured, thick and corky bark. The stem is thick and squat. This plant is considered a pachycaul [with a disproportionately thick trunk for its height, and few branches] succulent on the basis of its swollen stem base or tuber which forms early in plants grown from seed. … The large, digitately compound, cabbage blue leaves are one of its most distinctive features. 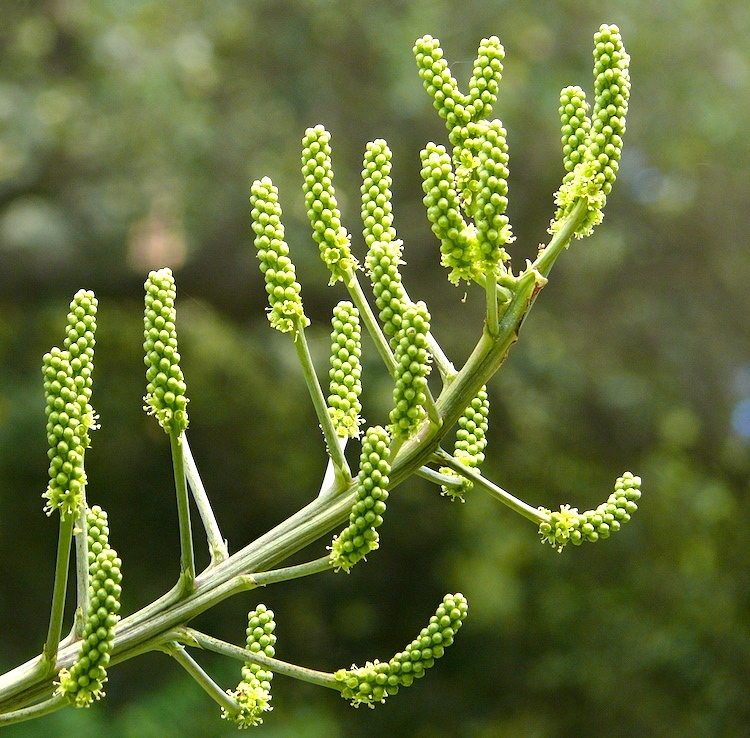 … these trees bear small, green, stalked flowers; in short dense spikes, making up a large, branched inflorescence at the end of the trunk or branches. Flowers are followed by fleshy and purple-maroon fruits, which mature in May to June [in the Southern Hemisphere]. 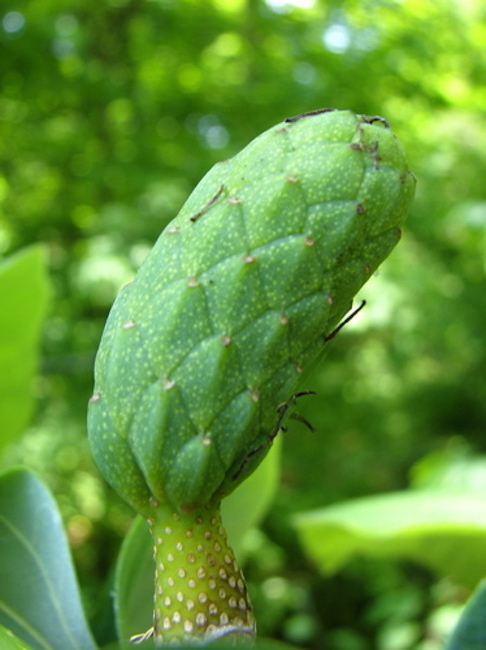 Magnolia acuminata, commonly called the cucumber tree (often spelled as a single word “cucumbertree”), cucumber magnolia or blue magnolia, is one of the largest magnolias, and one of the cold-hardiest. It is a large forest tree of the Eastern United States and Southern Ontario in Canada. It is a tree that tends to occur singly as scattered specimens, rather than in groves. … Unlike most magnolias, the flowers are not showy. They are typically small, yellow-green, and borne high in the tree in April through June. The leaves of Magnolia acuminata are pointed at the tip and provide it with its name – ‘acuminate’ means tapering to a fine point. 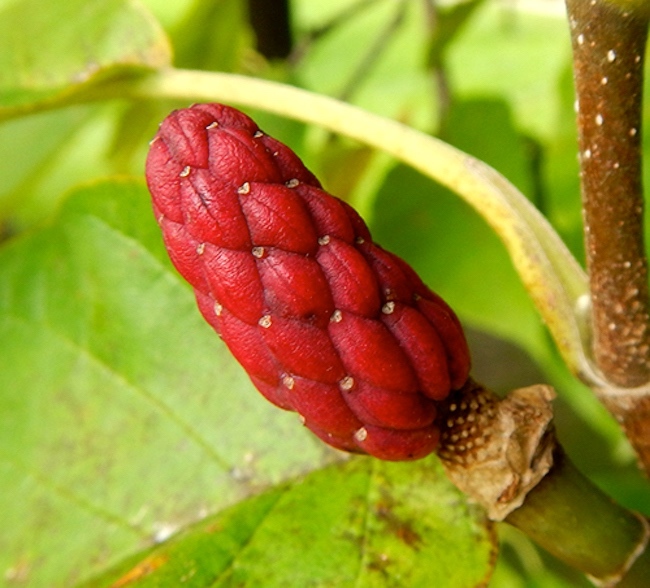 The name Cucumber Tree refers to the unripe fruit, which is green and often shaped like a small cucumber; the fruit matures to a dark red color and is 6–8 cm long and 4 cm broad, with the individual carpels splitting open to release the bright red seeds, 10-60 per fruit. This entry was posted on September 27, 2018 at 6:50 pm and is filed under Language and plants. You can follow any responses to this entry through the RSS 2.0 feed. You can leave a response, or trackback from your own site. It’s like thornless roses, seedless watermelons, etc.